As I have pointed out often on this site I am a member of the board of DCA. I am proud of what DCA has achieved and I have often pointed to it as a tangible legacy of previous Labour-led councils in Dundee. I was concerned to hear that DCA's twitter page was running a competition about street art which included looking for the best graffiti tags in Dundee. The story is reported in tonight's Evening Telegraph. Clearly some graffiti has artistic merit but - and this is big but - graffiti spoils areas. It has a major impact on the community and causes a lot of heartache. I have spoken to a number of people in the West End over the last few weeks when their house or properties near by have been attacked by graffiti, these people have been genuinely upset by the problems which this causes them. I have spoken to the Director of the DCA and he has reassured me that this competition has been stopped and that he hopes that their will be no re-occurrence of this. I am continuing to work closely with council colleagues, local people and council officers to work against the scourge of graffiti. This morning along with my colleague Jim McGovern I attended the Corso Street Sheltered Housing Spring Fayre. It was good to see so many people from Corso St, Abbotsford Street and Place. Well done to everyone involved. I will be supporting Earth Hour a campaign by WWF to highlight the issue of climate change. This is also being supported by the City Council who will turn off the lights at the McManus Galleries. The idea is to switch off lights for one hour on Saturday 27th March at 8.30 pm to show that you care about climate change. To find out more about WWF Scotland's work click here. I think that the Budget sets out the clear choice which will face the British people at the General Election. 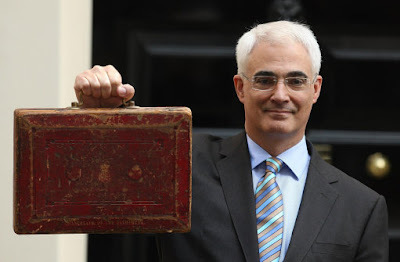 Alistair Darling set out the case today; it is also clear that the UK General Election will be a two-horse race between Labour and the Tories, between help for the many and help for the few. My colleague Laurie Bidwell and I have raised our concerns about cuts to the award-winning Peer Education Project. These cuts were only supported by SNP councillors, by Tory councillors and by the Lord Provost. The Administration is in charge of its own priorities the usual excuse of 'a big boy did it and ran away' will not wash. Cuts to the Fairer Scotland Fund will have an impact on real people in Dundee and these cuts are the responsibility of the SNP Administration. It would appear that their proposals lacked clarity so much that SNP councillors do not understand what they have done. Labour's Education and Leisure, Arts and Communities spokespeople on Dundee City Council, Councillor Laurie Bidwell and Councillor Richard McCready today raised their concerns that there will be budget cuts to an award winning scheme. The Peer Education Project recently won a Gold Award in the tackling health inequalities and improving health category at the COSLA Excellence Awards. Funding changes pushed through by the SNP-led Administration will result in a budget gap of £37,000. Councillor Laurie Bidwell said, 'I have also seen at first hand the excellent work of the Peer Education Project in the city's Primary and Secondary Schools. For example, peer educators from Craigie High School, have been working with pupils in P7 in their former primary schools to help make the transfer to Secondary School more positive. The beauty of peer education is that it not only benefits the young people who receive the peer education but the peer educators gain in confidence and self esteem as well. This is a win-win. Unfortunately the capacity of this project to maintain its current levels of activity will be undermined by the cuts imposed by the SNP Administration. This will be disheartening to the staff of the programme whose work has deservedly just received external recognition. These cuts will obviously put on hold plans to involve more schools in the Peer Education programme." The funding position for the Peer Education project is that a sum of £108,000 has been mainstreamed into the Leisure and Communities budget from the Quality of Life funding. The Fairer Scotland Fund allocation to the project was cut by £20,000 for the financial year 2010/11 and this combined with the effect of having a fixed budget allocation with rising staff costs, means that the project will have to find a way of addressing a gap of £37,000 for the next financial year. This afternoon I attended a briefing on the future of Community Councils. This was an interesting meeting, it looks like the council will not recommend too many changes in the West End. The West End Community Council should remain as it is, and the Community Spirit group will cover the north of the ward. I will be looking for the City Council to do more to promote Community Councils. I was saddened to hear of the death of Sir James Black a former Chancellor of the University of Dundee. Indeed in his role as Chancellor he awarded me my PhD. He was an eminent scientist and his legacy will be long-lasting. Click on the link to read the Guardian's obituary. As I am sure just about everyone knows the General Election has to be held this year. I've been spending quite a lot of my time campaigning. It is always good to get out and speak to local people about the issues which concern them. The response on the doorstep has been good. 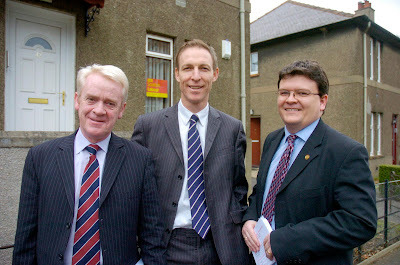 The picture shows Jim McGovern, the hard-working MP for Dundee West, Jim Murphy the Scottish Secretary and myself out campaigning last week. It's clear that lots of people know Jim McGovern and know that he has been working hard for them. They also know that a vote for anyone other than Jim is a vote for David Cameron to be in 10 Downing Street. There were meetings of the service committees of the City Council this evening. I spoke on a couple of items at the Leisure, Arts and Communities Committee. The agenda included a number of grants to a variety of organisations such as Dundee Rep, DCA, the Ice Arena and Dundee Leisure. I sought an update on allotments policy and I was delighted to hear of plans to reinstate allotments at South Road. I also welcomed the reuse of the Grove Centenary wing as a community sports hub. I am pleased that this building is to be used rather than demolished. I believe that to promote physical activity and to promote sporting excellence in sport these plans are to be welcomed. The Commonwealth Games in 2014 will be in Glasgow but it is important that there is a tangible legacy for other parts of Scotland such as Dundee. I wish this project the very best of luck and hope that it will be successful. I also hope that before too long similar hubs are established in other parts of the city. I also welcome investment in repairing the roof at Campderdown House. It is important that we look at ways of developing Camperdown House. Council offices are to be relocated there but it is important that everyone works together to find a long term viable public use for parts of Camperdown House. I was pleased to see that the Housing Committee agreed to invest in a refurbishment of the Lime Street Shletered Housing Complex. This is something that residents have raised with me and I have been campaigning for this refurbishment. The Policy and Resources Committee heard a couple of important reports. My colleague Kevin Keenan had requested a report on the impact of the Misuse of Drugs and Alcohol in the city. This is a very interesting report, the misuse of drugs and alcohol has a major impact on the council's provision of services. However, I do not think that this report went far enough, we require a report which highlights what we are going to do about this. The scourge of drugs and alcohol impacts upon the most vulnerable people in the city. We need to find effective means of dealing with drug and alchol abuse. The Policy and Resources Committee awarded funding to DEAP to run Job Brokerage for the Dundee Partnership. I am very pleased for everyone connected with DEAP, I hope that this is the end of this period of uncertainty. This report was issued late and officers were unable to help the Labour Group to formulate a motion which would have allowed extra scrutiny of these decisions. The debacle of the SNP Administration's attempts to push through its budget leaves a number of questions unanswered. This whole process lacked transparency and openness. The council must do better in the future and elected members should be given much, much more information than has been the case until now. Today I welcome the initiative of Tayside Police to place secure letter boxes in community libraries in Lochee and the West End. I attended this morning's launch of this scheme in Lochee Library. I welcome the work which Tayside Police are doing to ensure that they are as accessible as possible to the public. The secure letter boxes allow local people to tell the police about any concerns they have, anonymously if they wish. I think that the community surgeries which the police held recently are to be welcomed and I think that this scheme is also good. Local people with issues they wish to raise with the police should get in touch with the police; they can call the non-emergency number 0300 1112222; they can stop a police officer in the street; they can visit a police station; or they can visit a community surgery or make use of these secure letter boxes. For the West End I am glad that there is a secure letter box in Blackness Library and for the northern part of the ward there is a letter box in Lochee Library. If this scheme is a success I would like to see more of these secure letter box and one place I would like to see one would be the Mitchell Street Centre. Today is World Water Day. When I worked at Justice and Peace Scotland we campaigned for access to water to be a human right and I raised the issue with the UK Government on a number of occasions. This needs international action and I hope that it will come about sooner rather than later. In Dundee today supporters of Amnesty International are highlighting the issue between Israel and Palestine. I have taken the action which Amnesty International suggest and contacted the Israeli authorities asking that they take action to more effectively share this important human resource. I also support WaterAid who work hard in the UK to highlight the importance of recognising that water is a human right. Access to water should be a fundamental human right.